This article of Emily-Anne Owen quotes me. 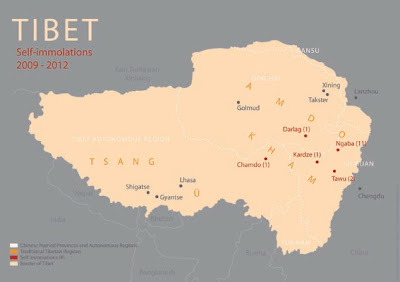 It has not often been mentioned in the media, but most of the 'immolations' and unrest occurred outside 'official' Tibet (the so-called Tibetan Autonomous Region - TAR). Though one can only regret of the spate of immolation, these extreme acts by Tibetan monks and nuns have redefined the map of Tibet. Till 2008, the Chinese leadership did not want to hear about the historical fact that Tibet was larger than the TAR. In 1987, the Dalai Lama had suggested in his Five-Point Peace Plan: "It is my sincere desire, as well as that of the Tibetan people, to restore to Tibet her invaluable role, by converting the entire country — comprising the three provinces of U-Tsang, Kham and Amdo - once more into a place of stability, peace and harmony. In the best of Buddhist tradition, Tibet would extend its services and hospitality to all who further the cause of world peace and the well-being of mankind and the natural environment we share." Beijing never accepted the Tibetan leader's geographical definition of Tibet, but the riots of 2008 and the recent immolations proved that Tibet was composed of three parts as defined by the Dalai Lama. It is tragic that known historical facts have to be proved that way. BEIJING, Jan 13, 2012 (IPS) - A Tibetan ‘Living Buddha’ who set himself on fire in protest against Chinese rule died this week, sparking a vigil of thousands of Tibetans and creating fears that self-immolations are spreading. The monk is the third Tibetan to have burned himself to death in 2012, and the 15th since March last year. Nine of the 15, two of whom were nuns, have died. Sonam Wangyal, a monk in his early forties, set himself alight last Sunday in the northeastern province Qinghai and was reported dead on Monday. In a sign that the recent unprecedented wave of Tibetan self-immolations is spreading, this was the first incident in Qinghai. The majority of immolations have occurred in Sichuan’s Aba prefecture, the site of an important Tibetan monastery that has experienced increasingly harsh crackdowns. Referred to by local Tibetans as the ‘Living Buddha Sopa’, Sonam Wangyal is the first reincarnate lama to have turned the flame on himself, and the oldest Tibetan to have died so far. Most so far have been in their twenties or teens. Suicide is frowned upon in Tibetan Buddhism, but there is a tradition of self-sacrifice for the ‘benefit of others’, advocacy groups say. "Sunday’s self-immolation was the first by a reincarnate lama. This was someone who is older, a mature person and an esteemed figure in his community. He would have been acutely aware of the ramifications for such an act in Tibetan Buddhism, and still chose to take his life in this way," Kate Saunders, communications director for the International Campaign for Tibet (ICT), tells IPS. Radio Free Asia reported that the monk wrote he was acting "not for personal glory but for Tibet and the happiness of Tibetans" in leaflets he handed out prior to setting himself on fire. He then drank kerosene and doused himself in it before setting himself alight. "His body exploded in pieces (and the remains were) taken away by police," said Radio Free Asia. According to the Tibetan exile government in Dharmasala, India, thousands of locals staged a candlelight vigil demanding the release of his body following its confiscation by the police. "Due to his position as a local spiritual leader, approximately 2,000 local Tibetans are said to have held a candlelight vigil urging the local police authorities to release his body," the exile government said in a statement. The state-run Xinhua News Agency has since reported that the body has been handed to relatives. "On the afternoon of Jan. 9, many fully-armed policemen showed up in the town, with guns, sticks, shields etc. The policemen dispersed the people demonstrating and did not allow the people to mourn in the temple," Tsering Woeser, the Tibetan activist and author, wrote on her blog. Earlier this week there were further signs of Tibetan unrest in a separate incident whena man was shot dead by police, sparking fierce protests in Gansu province, located in China’s northwest. Xinhua reported that the man, Gurgo Tsering, was killed accidentally by police after he allegedly stole from a construction site. ICT, however, cites local sources who claim the Tibetan died after police fired through the windows of his friend’s house. According to Radio Free Asia, Tibetans then attacked a local police station before police fired tear gas to stop the assault. Both the immolations and protests have occurred during a growing period of unease between the government and Tibetan populations in China. Following protests in the 2008 Beijing Olympic year, the Communist Party has overseen a severe clampdown on religious freedom among Tibetans, who view their rightful leader as the exiled Dalai Lama. Beijing blames the Dalai Lama for inciting unrest and has called the immolations "terrorism in disguise". Just hours after Sonam Wangyal’s self-immolation, Xinhua wrote that senior officials had "pledged stepped-up efforts to strengthen the management of monasteries in the fight against the Dalai Lama group." Officials must "push forward the patriotic and legal education among monks and nuns... and dissuade them from being duped by separatist forces," it said. The newswire also reported that Sonam Wangyal set himself alight after a clandestine love affair with a local woman was discovered. "(Crackdowns) are certainly counterproductive, but the Chinese have been at loss how to handle the Tibetans for the past 60 years," Claude Arpi, author of The Fate of Tibet: When Big Insects Eat Small Insects, tells IPS. "Today, the ‘collective’ leadership in Beijing believes that the more they will relax their grip, the worse will the situation become." For now there are fears that the death of the ‘Living Buddha’ will only lead to more protests and subsequent crackdowns. "(The Living Buddha) is a religious leader who enjoys a much higher reputation and a greater influence than a normal monk. (His) death is different from a normal monk’s. It brings much greater shock and influence to Tibetans,’ Woeser tells IPS. Tawang is not part of China! Less ideology, more compassion, please! Tibet: whom do you believe? Oh, Indian Youth, aren't you outraged yet?